This is a beautiful watch. I wear it daily, to work, around the house, and to special events. It has just enough sparkle to be beautiful with elegant outfits, and looks great on the same arm as my diamond wedding rings. Yet it is not overdone "bling" that it looks out of place with jeans and a sweater.The stainless steel bracelet is durable and cleans up easily. As a nurse, being water resistant is essential due to repeated hand washing. My last nice watch was broken during a battery replacement, so I wanted a watch that does not need one. The solar powered Eco-drive fills that requirement. I've only had it a week, so I hope I am as happy a year from now as I am now! Share your fashionable point of view starting with this hip watch with 64 Swarovski elements crystals on the two-tone stainless steel case. A sleek pink two-tone stainless steel bracelet and a white Mother-of-Pearl dial dotted with 12 Swarovski elements crystals. It had been over 20 years ago when I bought my first Citizen eco drive watch and it finally slowed down. 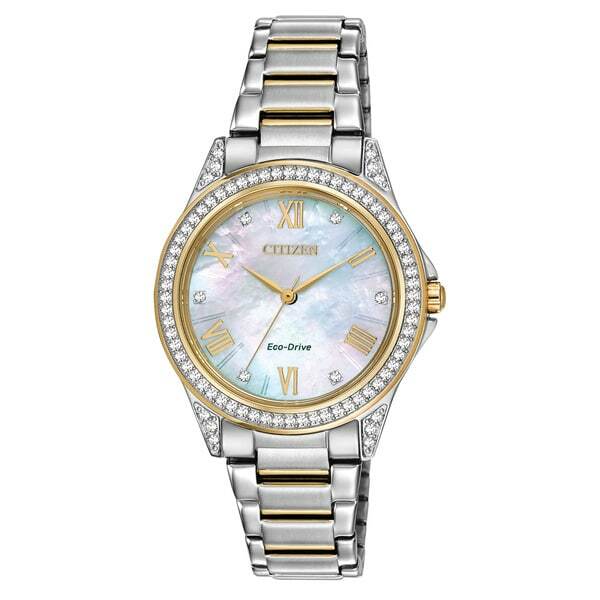 Replaced it with EM0234D a gorgeous two tone bracelet watch with pretty mother of pearl face and gold roman numerals. O have received numerous compliments and really love it! I had a similar, less expensive, watch that my dear hubby accidentally broke while replacing the battery. Loved the look. Do not want to deal with batteries again! He was so upset, and I hate being "watch-less"!